Local economies thrive when large and small businesses leverage the resources they have to offer. 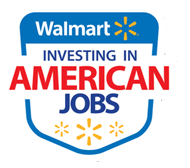 By combining the highest value activities from last year’s U.S. Manufacturing events, this summer, Walmart will take Investing in American Jobs to a new level. Join us for a two-day dynamic event on July 7-8, 2015 in Bentonville, Arkansas.